The whole duration of your trips lasts about 1-1,5 hours. Sit back relax and enjoy the beautiful and peaceful scenery at 1300ft of towline. All our Captains and crew go through extensive Parasail specific training. 30 years in the Parasailing industry. We have a 24-hour cancellation policy for a 100% refund. 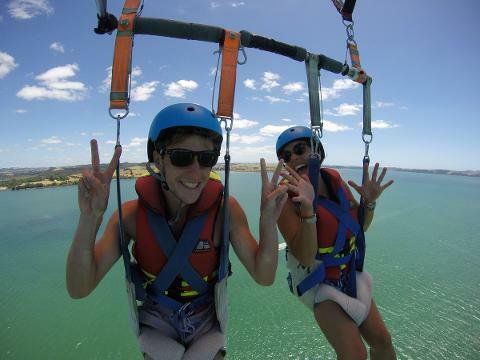 The skippers at Flying Kiwi Parasail reserves all rights to change any flight combinations.